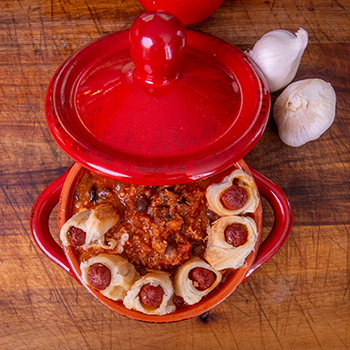 Chili Cheese Dog Dip – Stahl-Meyer Foods, Inc.
Unroll Crescent roll dough and cut each triangle into three slices. Roll a slice around each cocktail weiner, forming a Pig in a Blanket. Place each Pig in a Blanket side-by-side in a skillet, forming a wreath shape. Brush the top of each one with olive oil. In a medium-sized bowl, mix cream cheese, chili and cheddar. Pour mixture into center of wreath. Sprinkle the top of the dip with extra cheese.